We don't write books or do speaking tours. In fact, we barely do our jobs. 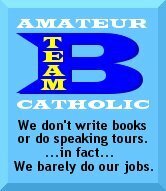 This is the home of the Amateur Catholic® bloggers - or as we like to refer to ourselves, the B-team. We don't write books or do speaking tours. In fact, we barely do our jobs. That's not to say we're unambitious though... You see, this coalition is just the second phase our blogoshpere conquest. We suppose you could think of us as amateur crusaders too. Membership will not bring you any money, perks, notoriety, or prestige - but you will get the privilege of proudly displaying the B-team badge on your blog! Lucky you, huh? If you are hosting a conference, parish function, or some other event and can not afford the exorbitant fees typically associated with a Professional Catholic®, please contact one of our members. We like to hear ourselves talk just as much as the Professional Catholics® do, we just don't charge you for it. But hey give us a meal, free beer, and a designated driver, and we'll speak about breaking the Da Vinci Code or anything else you might care to hear about. The B-Team badge is copryright 2006, The B-Team Bloggers®. Of course, we're Amateur Catholics®, so if you use the badge without permission (enrolled membership), we won't hunt you down and make you cough up your hard-earned bucks. Just have fun with it and maybe buy us a beer next time you're in town. know what to do with one. How many times have you heard that this week? I'm not even very good at that. thing about all this. What good stuff there is ain't mine. It's God's. And I can deal with that. So, if you don't mind, can I be one of you? Thanks and God bless. Ah! St. Blog has interceded for me! I was struggling to figure how to get that button to appear on my blog (other than just the image)!